As one approaches the Delaware River from the south 14 Foot Bank Lighthouse is the second Delaware Bay lighthouse to be seen, Brandywine Shoal lighthouse being the most southerly. Fourteen Foot Bank Lighthouse is named for the 14 feet of water that cover this shoal bank. The shoal is nearly 6,000 feet long and 1,300 feet wide and many ships lie beneath the sea in and around the shoal. Since 1876 the shoal had been lit by a lightship during most of the year, but due to the ice floe danger, it could not remain on station during the winter months when it was most needed. The Lighthouse Board decided to erect a lighthouse on the location. Many plans were submitted to the Board, but the Board finally adopted the proposal of its chief engineer, Major D. P. Heap, in 1883. Heap proposed to build a lighthouse with a caisson construction of a cast-iron cylinder 73 feet high with a 35 foot diameter, composed of 1.50" thick iron plates each 6 feet high and 6 inches wide with both horizontal and vertical flanges that would be bolted together to assure a water-tight fit. The government supplied the materials and requested bids from contractors to assemble and sink the caisson. The firm of Messrs. Anderson and Barr, a New York civil engineering firm was awarded the contract. They proposed to sink the caisson by means of a pneumatic process. A square wooden working caisson was constructed on the shore. It measured 40 foot square, 5 feet thick, with walls 7 feet high around all four sides. The water-tight structure was roofed on top and open at the bottom. The bottom was to act as a cutting edge when resting on the bottom of the bay. An air shaft was constructed in the center of the wooden caisson, and provided the means for entry and exit from the working chamber. The permanent caisson of iron was built atop this working caisson initially to a height of 18 feet. When completed the composite structure was towed into position on the shoal. A layer of concrete was put on top of the wooden caisson and this formed the floor of the permanent structure. Both units were then sunk to the bottom by allowing water to enter through 6 inch valves. The box and the cylinder descended slowly to the bottom of the bay, but unfortunately came to rest listing 12 . The top of the cylinder's upper edge was just inches from the surface of the bay, an increase of tide or wind conditions would drive the sea over the top thus repeating a disaster that occurred during the construction of the Rothersand Shoal Lighthouse. The engineers quickly averted disaster by adding additional sections of cylinder wall and filling the cylinder partially with rip-rap hastily procured on shore and rushed to the site by tugboat. The cylinder finally righted itself, the extra weight driving the edge of the wooden caisson deep into the bed of the bay. More sections of wall were bolted onto the iron caisson and the water was pumped out from below. The wall of the iron caisson was finally some 20 feet above mean high water. It became necessary then only to increase the length of the air shaft at the same rate at which the men dug into the bay bottom, and fill the upper iron caisson periodically with concrete to drive the wooden caisson to the required 33 feet into the bottom of the bay. Eight men worked eight hour shifts around the clock removing about two inches of bottom an hour. On August 18, 1855, the required depth had been reached, just one month after digging and concreting had begun. While the digging and sinking operation was going on, another group was busily engaged in the dumping of some 6,000 tons of rip-rap around the base of the caisson to secure it from movements of the current as well as to protect it from ice floe and shipping. The iron caisson was then flattened, the air shaft filled in, and a quaint, picturesque three-story gabled house built upon it. The lighthouse cost $125,000 to build. It is 59 feet to the focal plane of the light. 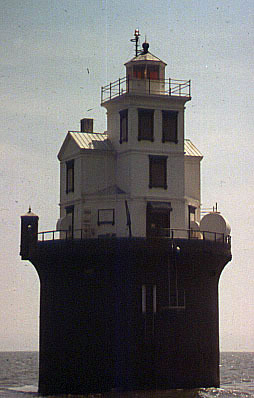 The lighthouse is still in operation and described on current nautical charts as "GP Fl (2) 20 sec. 50 ft. 12 m Horn," which indicated to mariners that the light is a group flashing light (2), every 20 seconds on a 59 foot tower, visible 12 nautical miles at sea and that the station is equipped with a fog horn.